~ This combo will be unapologetically complex and fun. Everyone is welcome to try it, but be "warn" this one won’t be slowed down for beginners/intermediates. Come out and challenge yourself. This one is a surprise, can't wait if you haven't caught them perform before this is your chance. 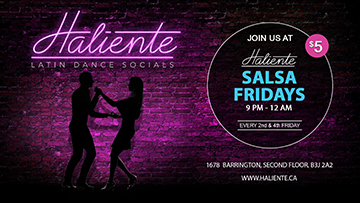 Playlist is made up of lots of salsa with a touch of Bachata and Kizomba. Each track is picked for their groove, upbeat, downbeat, and musicality. you don't want to miss this!